In conjunction with the ICT Spring Europe 2018 conference held at the European Convention Center in Luxembourg on 15-16.05.2018, the Space Forum took place focusing on space application and space exploration. The space industry has been transformed by declining launch costs, more and much smaller satellites in orbit and by major advancements in key technologies that are enabling commercial space exploration. Significant technological advancements allowed start-ups to create new business models and debut disruptive capabilities. Like the ESA Moon Village or the SpaceX Mars Colony project, the Luxembourg SpaceResources.lu initiative is considering new missions which are planned with significant private sector participation. Marc Serres particularly insisted on the importance to motivate next generations to study and work in fields that will eventually be important for the future of the space business. 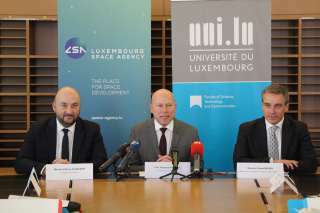 Luxembourg is implementing a comprehensive strategy to realize its space resources vision. Thus, the Grand Duchy will set up a space agency that takes into account the needs of commercial space companies and will create a space investment fund for space sector operations, with a first closing planned before the end of the year.